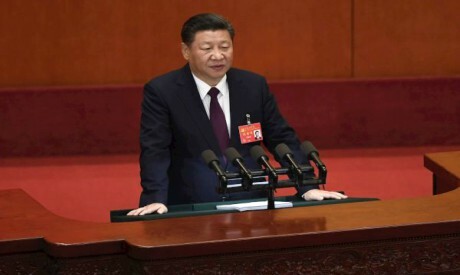 Chinese President Xi Jinping opened a critical Communist Party Congress on Wednesday with a pledge to build a "modern socialist country" for a "new era" that will be proudly Chinese, steadfastly ruled by the party but open to the world. Xi's wide-ranging speech, which ran nearly three-and-a-half hours, laid out a confident vision for an increasingly prosperous China and its place in the world, stressing the importance of wiping out corruption and making clear there were no plans for political reform. "Through a long period of hard work, socialism with Chinese characteristics has entered a new era, this is a new historical direction in our country's development," Xi said, using the term "new era" 36 times. The twice-a-decade congress, a week-long, mostly closed-door conclave, will culminate with the selection of a new Politburo Standing Committee that will rule China's 1.4 billion people for the next five years, with Xi expected to consolidate his grasp on power. Xi addressed more than 2,000 delegates in Beijing's cavernous Great Hall of the People, including 91-year-old former president Jiang Zemin, under tight security on a rainy, smoggy morning. As expected, the speech was heavy on aspiration and short on specific measures, but during Xi's first term, China disappointed many expecting it to usher in more market-oriented reforms. Xi promised, in what was likely an indirect reference to US President Donald Trump's "America first" policy, that China would be fully engaged with the world, and reiterated pledges to tackle climate change. Xi envisioned China developing into a "basically" modernised socialist country by 2035, becoming one of the world's most innovative countries with the income gap between urban and rural residents significantly reduced, and its environmental woes fundamentally eliminated. By 2050, Xi said, China would become a modern socialist "strong power" with leading influence on the world stage. But he signalled there would be no political reforms. China's political system was the broadest, most genuine, and most effective way to safeguard the fundamental interests of the people, said Xi, who has overseen a sweeping crackdown on civil society, locking up rights lawyers and dissidents. "We must remain as firm as a rock in our resolve to build on the overwhelming momentum and secure a sweeping victory," Xi said. He made no mention of neighbouring North Korea, which has angered Beijing with repeated nuclear and ballistic missile tests in defiance of UN sanctions and which sent a congratulatory message ahead of the meeting. Xi has consolidated power swiftly since assuming the party leadership in 2012, locking up political rivals for corruption, restructuring the military and asserting China's rising might on the world stage. Key questions include whether Xi ally and top corruption-buster Wang Qishan will stay on past traditional retirement age and to what extent Xi will promote allies to senior positions. Close attention will also be paid to any moves that would enable Xi to stay on in a leadership capacity after his second term ends in 2022. That could include resurrecting the position of party chairman, a title that would put him on par with the founding father of modern China, Mao Zedong. As with other major set-piece events held in the capital, Beijing has been blanketed with security, with long lines at some suburban subways stations as passengers waited to go through metal detectors and be patted down. Coverage in state media and across the city has kicked into overdrive, with large red banners plastered around Beijing welcoming the congress, while censors have stepped up already tight monitoring of the internet. Tencent Holdings Ltd's WeChat, China's top social media platform with more than 960 million users, released a short statement late on Tuesday saying that, due to "system maintenance", users will be unable to modify profile pictures, nicknames and tag lines until the end of the month.